The Dressing Room opened off of the Imperial bedroom. Every morning the Empress would rise to find her clothes set out by her maids and waiting for her in this room. The maids had private access to the room via an ashwood staircase from their work room on the mezzanine level, where the Empress's clothes were stored and prepared. The staircase lead to the toilet which opened off of the dressing room. The Grand Duchesses used this internal staircase which ran from their rooms via the maid's mezzanine and a second bathroom to their mother's room. Left: The door to Alexandra's toilet and bath. Alexandra selected her clothes for the week in advance based on the activities she had on her calendar and her personal preference. She would meet with her maids and go over this selection. Each day she would receive a written recap of what was planned for the following day and she would then make final instructions for her wardrobe. Sometimes she would be undecided about what she wanted to wear and would request several outfits to be made ready for her to select from. After bathing, Alexandra dressed herself. She would change her clothes several times a day, dressing more casually for the morning, and then more formally for luncheon and tea. The Empress was attired regally in expensive evening dresses for dinner, set off with magnificent jewels, even when she and Nicholas dined alone. After dinner Nicholas returned to work and the Imperial couple rejoined for a late evening tea, which was often served in Nicholas's Working Study. Following this the Empress would return to her rooms to prepare for bed. Her dressing gown and bedclothes would be waiting for her in the dressing room. Like clockwork, the clothes she had selected for the day would appear in this room at the proper time. The maids were expected to do all of this as quietly as possible and promptly on schedule. When Alexandra entered her dressing room she expected the maids to be gone and everything waiting as she had instructed. 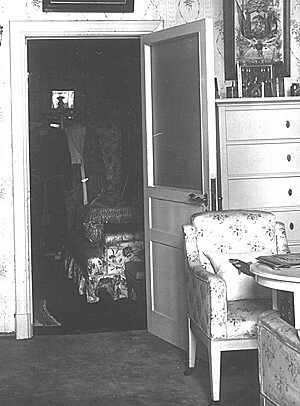 On the right-hand wall was a wall phone for her to speak with her maids upstairs if something wasn't quite right or if she needed some accessory. As mentioned earlier, a staircase made of ashwood led from the dark toilet to the children's floor above. Halfway to the children's floor the mezzanine level had a low ceiling that was criticized in the Soviet period for having violated the Tsarskoe Selo building code. Alexandra had two long-time maids, Zanotti and Tudelberg. Zanotti was born of Italian and English parentage, while Tudelberg was German. These assistants didn't wear the customary uniforms or lace caps to set them apart as maids. They had rebelled when it was suggested they do so, because they considered themselves "ladies' companions" rather than servants. Their responsibilities were considerable and they were expected to be on call most of the time. They lived in the palace upstairs across from the rooms of the Grand Duchesses. Each maid had her own assistants. Zanotti and Tudelberg remained unmarried while they were in service to the Empress. They observed strict secrecy regarding the family's affairs and were kept apart from the other servants and the public. These two woman had come with Alexandra from Germany. They spoke English with her and in the 20 years they lived in Russia hardly learned any Russian. This closed them off even more from the outside world. The work of the maids was hard and demanding. The Empress' clothes were of the finest quality and often had exquisite hand-done embroidery and face-trimmings. Her clothes were difficult to keep in perfect condition - most of Alexandra's fine dresses required hand-cleaning. The damp climate also took its' toll on the fine fabrics and meticiously pressed frocks. 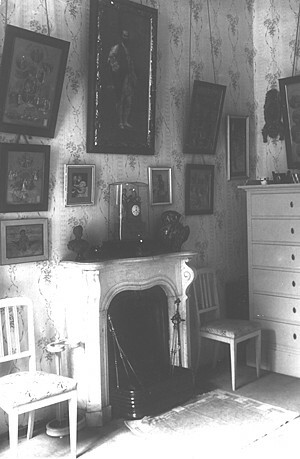 Right: The dressing room fireplace; above the fireplace is a large picture of Alexandra's father, the Grand Duke of Hesse. The equipment for maintaining the Empress' clothes was extremely up-to-date. The maids used electric irons to press the Empress' clothes and stored her furs, fine shawls, gloves, evening wear and other clothes in big oak closets protected against damp and moths. They were provided everthing they needed to ensure Alexandra looked her best at all times. The Tsar and Tsarina's clothes were cleaned in the laundry of the Anichkov Palace of St. Petersburg. They were bundled in hampers and special bags for transport. The clothes of the children were washed in electric washing machines in the Imperial laundry of Tsarskoe Selo. The dressing room had simple furniture which was painted ivory and covered with cotton chintz fabric. 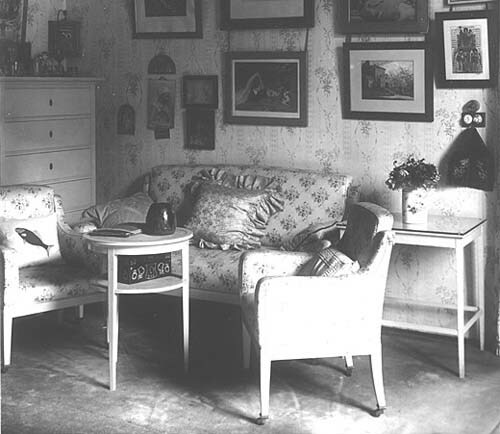 The arm chair in the picture at the top has a fish pillow- another embroidery by Alexandra or one of her daughters. The floor was covered by a fine sewn English carpet. The door to the Empress' toilet and bath is on the left. The room has a fireplace, it was important that this room be kept warm. On the right wall was a thermometer with a buzzer to the heating rooms down in the basement. Alexandra would signal the attendant there if the room was too warm or cold. Above the fireplace were original watercolors showing the baptisms of Marie and Anastasia, they were artists original designs for popular prints commemorating these events. The dressing room, toilet, mezzanine workroom and bathroom were all constructed in 1895 from one room. After the war these rooms were ruthlessly destroyed by the Soviets - in the process of ripping them out a beautiful neoclassical painted ceiling was discovered and restored by the celbrated Soviet restorationist Treskin, who also restored Pavlosk Palace.